Going camping has many benefits to the human soul. There is something to be said for leaving your city and heading for the woods to connect with nature. In fact, there are proven health benefits to spending time in the woods. Without cell service, you won’t have a phone to bother you all day long. You’ll take in trees, rivers, and wildlife instead of responding to texts and e-mails. You may even sleep better as you use the natural sun as a clock instead of your alarm. Even a few minutes walking in nature has proven to boost mood and fight depression. Disconnecting from it all to reconnect with nature can be a life-changing experience. Tourists cooking coffee on primus near the tent in the mountains. Foggy and rainy camping while hiking. However, with nature comes adverse weather, which is often unpredictable. You must be prepared to deal with instantaneous weather changes on your journey. Catching yourself unprepared during a torrential downpour won’t leave much room for a spiritual realignment. We’ve done the research for you and have created the ultimate guide of how to camp in the rain. The key to (cheerfully) surviving any unexpected storms while camping is to stay as dry as possible. You may have purchased the tent of your dreams that provides wonderful shelter, but it won’t really matter if you’ve chosen a poor campsite, or location within the campsite. A great campsite needs to be on high ground when it comes to how to camp in the rain with any success. If you set up in a depression in the ground, you will end up with a swamp around you when it rains. We discuss tent location in our growing list of camping tips and tricks. You need a high ground campsite that allows rain to drain away from your tent and living areas. While your campsite will surely be damp, it won’t turn into an unwanted swimming hole. In regards to purchasing a tent for your trip, it does need to be of the highest quality. If you need to fork out a little more money on a tent that has a good fly or a base that keeps water out, do so. When it comes to how to camp in the rain, you should still put a tarp over your tent regardless of its shelter capabilities. If you need to do a trial run, set the tent up in your back yard. Zip up your tent and close the window flaps then spray the tent with your garden hose and see if any water leaks through. These tent waterproofing tips are also worth a read. Knowing your tent’s capabilities before you head into the wilderness for any length of time will be valuable information. If you need to reinforce or trade in your tent, you’ll be happy you did when the rain doesn’t come through. Again, when it comes to that peaceful rest you’ll only get from a day in nature, you need to make sure your tent is in the perfect location. Position your tent so the front door faces downhill. You don’t want the wind to blow rain into your tent from the sides or front that can’t drain out because it’s facing uphill. Tarps will be a great friend to you when it comes to how to camp in the rain. Tarps can be over and under your tent for optimal protection. Don’t be afraid to use tarps as much as you’d like. Dig a little trench around your tent to make sure water stays away and is directed from it. The trench should be 3 to 5 inches deep and go all around your entire shelter. Do not dig a trench in a V-shape. Keep the trench square and just a few inches from your tent. At the lowest point of the tent create an opening so water can exit from there. You do not want your trench to end up backed up or overflowing. As you dig, make sure and throw the dirt away from the tent. Wet dirt resting up against your tent can cause your tent material to slowly rot. Use padding underneath your sleeping area so even if the base of your tent does get damp, you won’t ever feel it. You’ll stay dry with your beds elevated, and the padding will provide insulation for your tent. Your camping guests will think you’re a true pro on how to camp in the rain when they find themselves dry after a night of rain. The most mentioned tool so far in the article has been tarps, so of course, pack tarps! You should also pack garbage bags and large Ziploc bags to keep your equipment and food safe and dry. Rain gear is always a good thing to pack, especially if you plan on hiking during the daytime rain hours. Ponchos are a great tool for how to camp in the rain (or hike). A great jacket or windbreaker that keeps you warm and dry will be of great help. Warm clothing is important considering many camping sites are usually elevated, so temperatures drop below what you might be accustomed to. You should avoid cotton at all costs and go for nylon and synthetic under garments. Cotton will just soak up the rain where other materials can dry quickly and even deter water. A good stove is really important because even in a downpour, you must eat! Purchase a stove that is light in the rain and runs on gas. Heating up a hot toddy in the rain to take into your tent can make for the coziest camping trip ever. Consider packing some easy-to-carry card games or other in-tent entertainment. While you wait for the storm to pass, a board game or two will create a fun atmosphere to pass the time in. Regardless of where you’re camping, rain can happen at any time. While some areas are more prone to storms, an unexpected downpour can happen in even the driest of campsites. 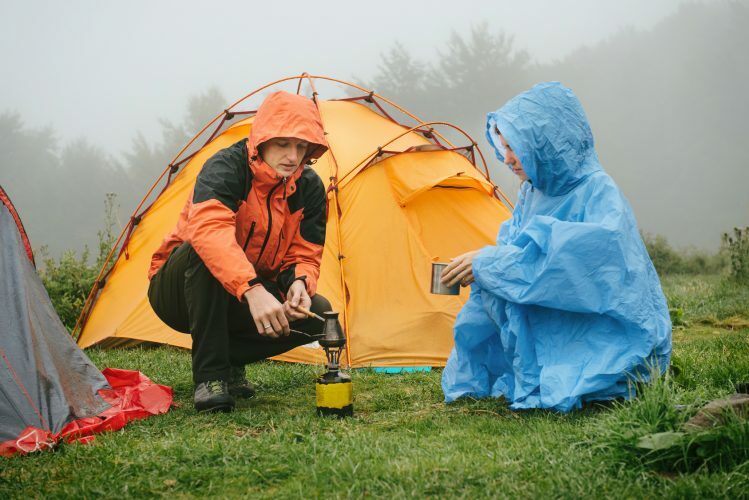 Be prepared when it comes to how to camp in the rain by finding an elevated campsite, a fantastic tent, protective clothing and great equipment. With these tips, you’ll be so prepared for that rainstorm that you’ll see the beauty in it instead of the nuisance. After all, aren’t we going camping to enjoy what the planet is offering us, come rain or shine? What are your experiences with camping in the rain? Share in the comments!